No matter what business you're in, you'll learn simple and productive methods to communicate directly with your customers in order to build your reputation, generate new leads and, ultimately, increase your profits. Like any long-term business investment, content marketing requires a sound strategy. This includes the right structure, processes, and resources. At key points along the way, you’ll track your progress and adapt to external conditions. Content must be maintained to be successful, and that takes a lot of hard work. However, content problems arise precisely because owners don’t take the time to do maintenance. Content is the most important factor. Make sure that it is always updated, organized, and relevant. Keep in mind too that content is not only text but also video, photo images, audio, infographics and everything else that lives in your website. It is very important to have high content quality on your website, not only to optimize user experience but also to ensure that your brand is consistently held in high regard. Content marketing is pretty great. It allows your business to educate leads and prospects. It helps you gain customer trust and boosts your credibility. It enhances your SEO efforts and social media marketing efforts. It improves your thought leadership, and it does a bunch of other good stuff for your business. Creating content like blog posts, eBooks, and whitepapers are great because it allows you to generate web traffic, educate leads, and more. But when it comes to how to increase revenue with content marketing, you must consider the conversion process. Content marketing creates awareness by reaching the potential customers. It educates them about the product they inquire about. It creates marketing relationships by building its goodwill in the market by publishing frequently. It has been called the “new branding of text documents” as it consistently reaches your potential and current clients and reinforces that promise. Content marketing does more than drive clicks; it helps sell your products and services. It continues long after the sale as it constantly reminds the customer of you and your business. 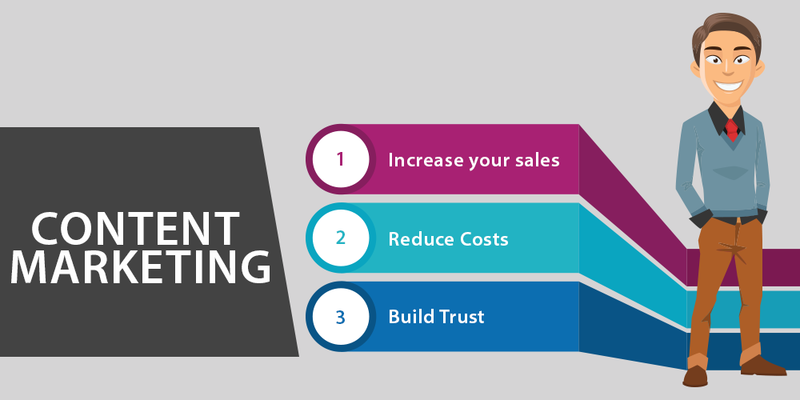 Content marketing can cut advertising expenditure for your business. it’s become the cornerstone of many a sound marketing plan in terms of brand awareness and driving sales. With very little upfront cost and the potential for high ROI, content marketing is a strategy that’s paying off for many companies around the world. All it takes, like any marketing strategy, is skill and consistency to make it work for you, your business and your bottom line. If you publish frequently, your content will build trust not only with your potential clients but also with the search engines. Search engines want to deliver the very best content possible to the audience using their engine. Oral Communication is also a key to build trust between publishers and clients. Your potential clients will trust you more as you are providing transparency around your products and services. Ultimately, the more informed you can help your potential customers be, the more trust they’ll have in you. To sum up, digital technology has made it easier for your business to do it. Continued developments and an increased desire for authenticity mean there’s no going back. So much content is “evergreen” too, so it will last throughout the seasons. You may just need to prune it or take a cutting to produce new growth.